The story behind King George VI's reluctant ascension to the throne is one of fortitude, camaraderie, and the pressure of royal leadership on a man who doesn't naturally take to a dynamic public voice, either by radio or in-person. His struggle with stammering proves to have an enduring ability to captivate by the success of The King's Speech, in which his relationship with speech therapist Lionel Logue develops amid the emotionally trying path he travels before leading his people into war. Julie Sawyer's documentary The Man Behind the King's Speech understands and respects that Tom Hooper's Oscar-winning film stanchly chronicles the events surrounding the English monarch's accession; with that, it skillfully reinforces and expounds on the history -- both pre- and post-WWII -- through extensive archival footage and restrained yet astute interviews. The Man Behind the King's Speech could be segmented into clearly-defined halves: George VI's life before he led England to war, and the time period leading up to his death; while obvious, this partition dictates the tempo and context of the interviews. The first half essentially focuses on the same material as The King's Speech, alongside a brief introduction to his father's place in WWI and his wife, and it leads the historians and writers -- Royal Correspondent Tim Ewart and authors Peter Conradi and Mark Logue, Lionel Logue's grandson -- to reservedly retell, affirm, and expand on his story while interviews with actor Colin Firth and Tom Hooper gravitate around the monarch's speech impediment (as well as Firth having to ingrain himself with a stammer). Ewart and Conradi add insight on Edward VIII's public support through his union with a married woman, the importance of Winston Churchill' boisterousness, and, of course, the extent of the distinctive relationship George VI shared with his Australian speech therapist. When the documentary reaches the later years of George VI's life -- the post-speech events revolving around his stalwart, empathetic leadership during WWII and his steady physical decline -- some might expect the interviews to increase in frequency to elucidate the content not covered in The King's Speech, one of its presupposed key draws. Surprisingly, Julie Sawyer finds a way to rear the rate of interviews back even further and still sustain the doc's intended tone, only elaborating on the king's political adaption and his ill health when the archival footage requires punctuation, notably around his death. Some might find this free-form direction simplistic, even though the accompanying audio from radio and news telecasters offers its own antiquated insight and narration; on the other hand, it paints a clear portrait of a man, father, and husband attempting to support the pressure that befell him after his famous speech, while avoiding belaboring the pressures themselves on a historically-elaborative level. Wisely, Sawyer's piece lets the stretches of historical recording do as much of the heavy lifting as the commentary explaining what we're seeing. From the opening moments where George VI's voice adorns a slowed-down shot of the royal family, it maintains a graceful rhythm of lengthy recordings only being interrupted by historians, writers, and the cast/crew of The King's Speech when pertinent. 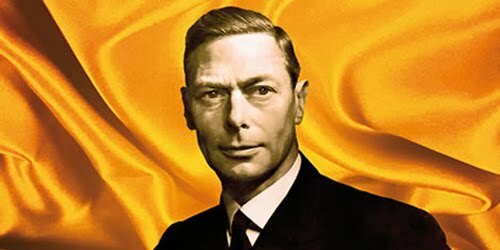 Oftentimes, the audio itself accompanying the footage, whether it's George VI himself speaking or newscasters narrating the material, paints a clearer picture than the versed experts could, while also allowing the tenor of the era to give the documentary an absorbing vintage keel. Having these raw stretches of George VI on-film -- from assorted coronations to radio addresses and uncomfortably-conducted public duties -- compacted within a seamless hour-long stretch makes it worth this subtle but effective documentary's time alone, especially in the ability to witness the toll that WWII inflicted upon him.